It’s #WeddingWednesday and we’re celebrating by recapping some of the beautiful custom lighting and décor designs we had the opportunity to create for our July 2nd, 2016 couples! Christa Clarke & Jacob Owolabi exchanged vows in front of their family and friends at the Orland Chateau in Tinley Park, IL! 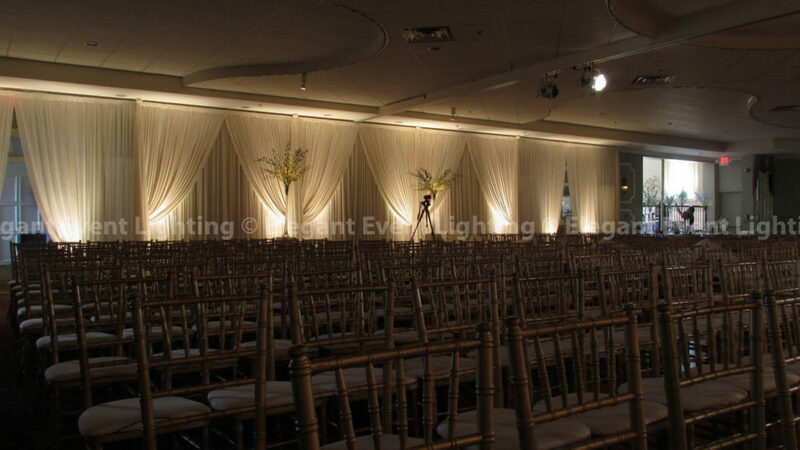 Elegant Event Lighting designed a classic pleated ivory fabric backdrop for the couple’s ceremony. The backdrop ran floor-to-ceiling and was bathed in soft white uplighting. We loved working with Tori from Revel Décor on her couple’s Millennium Knickerbocker Hotel Wedding! 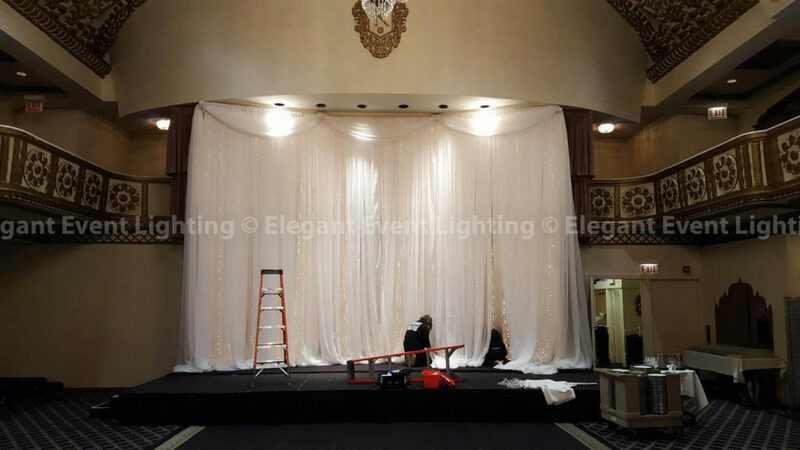 The EEL Chicago Team designed a white sheer fabric backdrop that adorned the ballroom stage. Vertical strands of fairy lights intermingled in the fabric created a soft, romantic glow in the ballroom. Lauren Wolf & Todd Heitman celebrated with family and friends at their Wedding Reception at Cuneo Museum and Gardens in Vernon Hills, IL! Elegant Event Lighting Chicago framed the bridal party head table with a double layer ivory fabric backdrop. The backdrop’s gorgeous fabric swags and pleating were accented with soft pink uplighting. 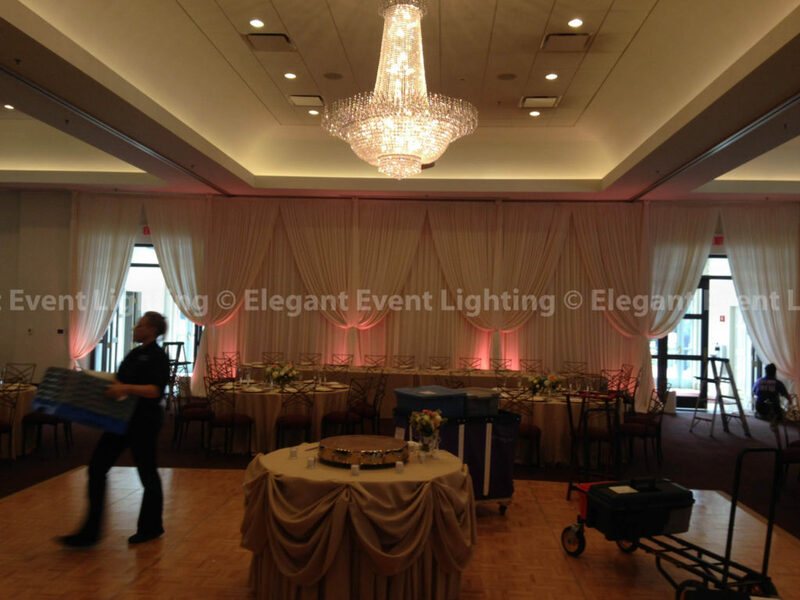 To all of our couples – thank you again for choosing Elegant Event Lighting Chicago! It was a pleasure working with all of you and we are happy that we could turn your lighting and décor dreams into a reality for your Wedding Days!